Get Free Aloetouch Gloves Sample. Fill out the short form to receive. Choose between different kind of samples and fill out the form to get yours. Note: Job title required. 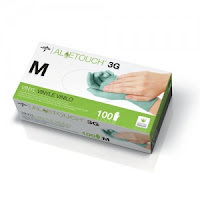 All requests for Aloetouch exam gloves are subject to review. This study demonstrates that health care workers who use aloe vera gloves had less skin irritation and better compliance with hand hygiene requirements. Further, the introduction of aloe vera medical gloves could lead to a reduction in infection rates.